This couldn't be easier, more customizable, or more stunning! This festive season calls for celebrating in style. 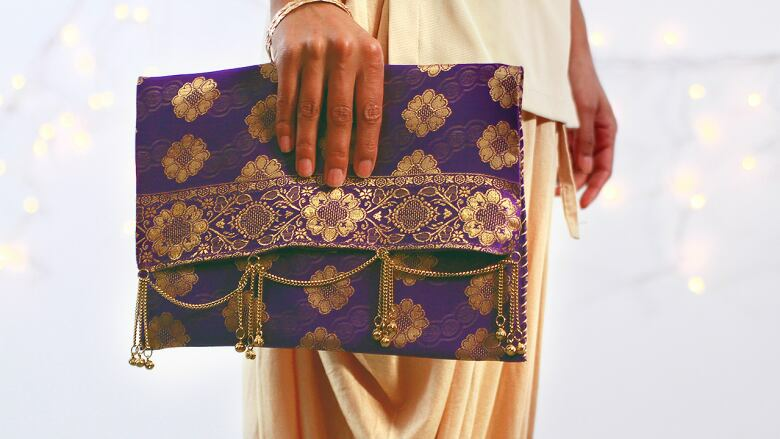 This purse is easy enough to make in time for your Diwali celebrations this weekend, and would be perfect for parties through the entire holiday season ahead of us. Use this project to customize your ensemble using any colour, pattern, or even repurpose an old sari – it's sure to complement any outfit you've already got planned. With minimal sewing, you basically only need a little bit of time and you've got yourself a gorgeous new accessory for the holiday. 1. To begin, cut out two identical rectangular pieces from your fusible iron-on interfacing. 2. Then, cut out two pieces the same size as your interfacing from your silk cloth. 3. Lay the interfacing on top of the silk cloth pieces, iron the lining onto the silk and then trim any excess fabric. 4. Repeat this process for the second piece! 5. Next, iron on the hemming tape to the silk side of both pieces. Be sure to leave a gap in the middle of a short side of each piece. 6. Peel the hemming tape and lay both pieces together, with the tape sides facing, and then iron them together. 7. Carefully pull the fabric inside out and then fold one third of the fabric over. 8. Using your coordinating thread, sew both sides of the folded section. 9. Fold the remaining third of your fabric over your sewn section. Use your decorative chain as a trim, measure the correct amount and trim excess using both pairs of pliers. 10. Use a needle and clear thread to sew the chain onto the purse, and you've got a stylish new accessory in time for Diwali!